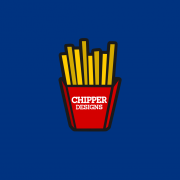 I have been fiddling with a new la clippers logo (cause my friend wanted me to design one) wanted some opinions i think theirs something missing but dont know what. Wouldn't it be a pair of scissors. Get it "Clippers"
I think the Clippers mark is to small & the boat looks a little small or the circle is too big. I like the suggestion of the basketball but only if it done without looking forced. This is definitely a step in the right direction for a Clippers logo. I echo what HVF said: either the ship and wordmark are too small or the circle is too big. I'm more in favor of shrinking the circle down a bit. Secondly, I'm not so big on a basketball design for the sail's shading, as it's absolutely great as it is. If it's done right, the basketball could look good as well, but you'd have to make sure it was good. I also think adding a "Los Angeles" above the Clippers script would make it look more like a basketball logo. The only NBA teams that don't use both the city name and nickname in the primary logo are the Indiana Pacers and Washington Wizards. Lastly, I don't dig the grey background. Make it look like it's sailing out on the ocean, like try adding a light blue background with a couple of white clouds if you really want to. I know people always say that the Clippers could benefit from making their blue a light blue, but I think you could incorporate both blues in this very well. Can't wait to see where you go with this! It needs some clean up, as you mentioned, but the update is much better. It's definitely an upgrade, nice work. I'm not too sure about having the basketball there bur maybe it would look good if the background was a different blue. A little experimenting in Paint tells me that a good option would be using the color with the RGB values of 98, 177, and 237. Try it out and see how it looks to you. I would rotate the basketball so the grooves/lines on it work in the same direction the shading of the sails do. 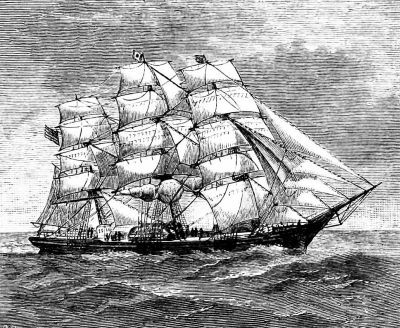 A clipper ship is larger than the one you depict in your logo. As miken623 and KGB_slicedbread have pointed out, a Clipper is much larger than the little sailboat you have here. The original Clipper logo only featured three triangular sails at the very front of a clipper. Here is a drawing of what we're talking about. I might suggest taking out the wordmark entirely and make it an alternate or secondary logo. I still think it is a fantastic piece of art. And yes this is coming from a Clippers fan.